"My Buddy Blues"/"Return, Gal Of Mine"
Above: Photo of The Five Breezes. 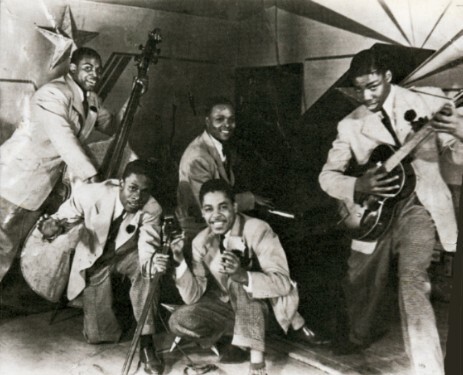 This Chicago group consisted of Joe Bell, Leonard Caston, Gene Gilmore, Willie Hawthorne, and Willie Dixon. Dixon (far left with bass) and Caston (at piano) later formed The Big Three Trio with Bernado Dennis. Above: Label for Bluebird B-8614-A recorded on 11/15/40 and released in January 1941. 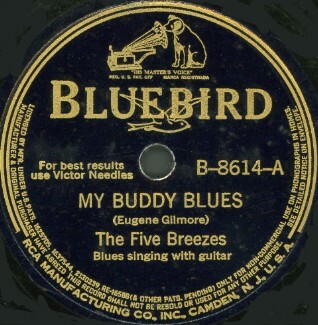 The Five Breezes had four records released on Bluebird (1940-41), all sides recorded on the same day. A) Click on an option below to listen to The Five Breezes using Streaming RealAudio. B) Click on an option below to listen to The Five Breezes using Downloading RealAudio.